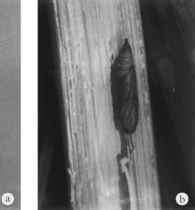 (b) borer damage on capsule; (c) larve of Conogethes punctiferalis inside cardamom shoot. the shoot. During the ensuing pre-pupal period of a day or two, they remain quiescent within a self-made cocoon and soon become pupae (Fig. 8.4b). Pupa is 10—15 mm long, pale green soon after its formation and gradually changes to deep-brown. Pre-pupa and pupa are non-feeding, harmless stages. After 10—12 days of pupal period, moth emerges out through the bore hole. Its life cycle during March—October is completed within 41—68 days, while during the winter months of November—February, it prolongs to 123 days (Varadarasan etal., 1991). The pest population attains peaks during December—January, March—April, May—June and September—October under Lower Pulney conditions, whereas it is highest during January—February, May and September—October under Kerala conditions (Varadarasan etal., 1989). 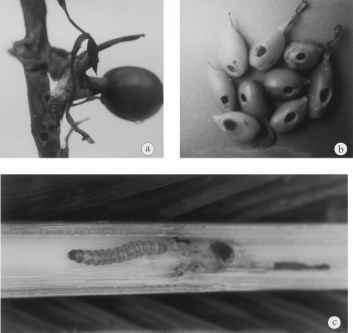 The pest is polyphagous; the alternate hosts recorded include guava (Psidium guajava L.), mango (Mangifera indica L.), peaches (Prunus persica Benth. and Hook. ), pomegranate (Punica granatum L.), jack (Artocarpus integrifolia L.), ginger (Zingiber officinale Rosc. ), turmeric (Curcuma longa L.), avocado (Persia gratissima Gaertn. ), mulberry (Morus alba L.), loquat (Eriobotrya japonica Lindl. ), pear (Pyrus communis L.), sorghum (Sorghum bicolor (L.) Moench. ), cocoa (Theobroma cacao L.), castor (Ricinus communis L.), tamarind (Tamarindus indica L.) soapnut (Sapindus emarginatus Vahl. ), Caesalpinia bonducella and Annona cherimola (Jacob, 1980). Nambiar etal. (1975) observed Curcuma aromatica, C. amada, Alpinia sp., Amomum sp. and Aframomum melegueta as its alternate hosts. Other recorded alternate hosts include Amomum subulatum, A.microstephanum, Hedychium coronarium, H. flavescens and Alpinia galanga (Anonymous, 1985b). Under natural conditions C. punctiferalis is host for a number of parasites; Angitia trochanterata (Ichneumonidae), Threonia inareolata, Bracon brevicornis and Apanteles sp. Figure 8.4 Panicle, capsule borer: (a) adult of C. punctiferalis; (b) pupa of C. punctiferalis. parasitize its larvae, while Brachymeria emploeae parasitise pupae (David et al, 1964). Patel and Gangrade (1971) noticed Microbracon hebetor as its larval parasite. Joseph et al. (1973) reported two hymenopterans Brachymeria nosatoi and B.lasus parasitizing on C. punctiferalis. Jacob (1981) reported Myosoma sp., Xanthopimpla australis and a nematode as parasites on C. punctiferalis. Varadarasan etal. 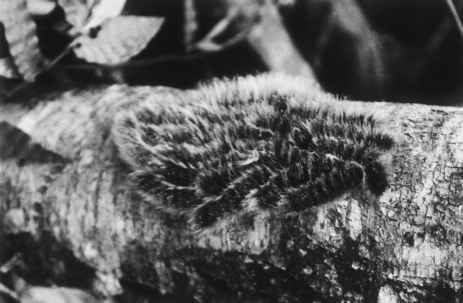 (1990) reported Temelucha sp., Agrypon sp. and Friona sp. as parasites of C. punctiferalis. Natural parasitisation by Agrypon sp. on larvae of C. punctiferalis was maximum (19.8 per cent) during November in Udumbanchola area (Balu et al, 1991). Several insecticides were evaluated against this pest. David etal. (1964), Sulochana et al. (1968) and Saroja etal. (1973) recommended fenthion, BHC, DDT, endrin, malathion, trichlorfan, methyldemeton, imidan and carbaryl against this pest. In a field trial conducted at Lower Pulneys, monocrotophos 0.1 per cent was found most effective (Kumaresan etal., 1978). From the field trial conducted by Regupathy (1979) carbofuran (2 kg a.i./ha) was found effective. Joseph and Kumaresan (1982) reported that collection and destruction of infested parts and alternate hosts followed by spraying any one of the insecticides viz., lebayacid 375 ml/300 l water/acre or nuvacron 750 ml/300 l water/acre or thiodan 900 ml/300 l water/acre or Ekalux 600 ml/300 l water/acre or zolon 900 ml/300 l water/acre or Rogor 1 l/300 l water/acre is effective control measure against this pest. In a trial with 13 insecticides, Naganathan et al. (1983) found garvox, acephate and sumicidin (each at 0.1 per cent) effective against this borer. A strategy of collection and destruction of moths and infested tillers followed by spraying monocro-tophos 0.075 per cent or fenthion 0.075 per cent is recommended against this pest (Anonymous, 1985b). Krishnamurthy et al. (1989) recommended the removal of affected tillers during September—October if the infestation is less than 10 per cent and spraying quinalphos 0.03 per cent, if it is above 10 per cent. Even the higher doses of insecticides imposed are not effective against the late stage larvae housed within shoots. Therefore sprays have to be targetted on first or second instar stages of the larvae, which feed on tender panicles or immature capsules. This can be achieved by monitoring adult emergence in field and spraying either monocrotophos 0.075 per cent or fenthion 0.075 per cent within 12—15 days after adult emergence (Varadarasan etal, 1989).